Danny Lewis maneuvers past 6-foot-9 Mo Njie to score during the first half. Patrick Ivory scores over Ryan Marchal during the first half at Centerville. Jordan Smith hits a first half jump shot against the Elks. Prophet Johnson fights his way past Centerville defender Ryan Ballard. 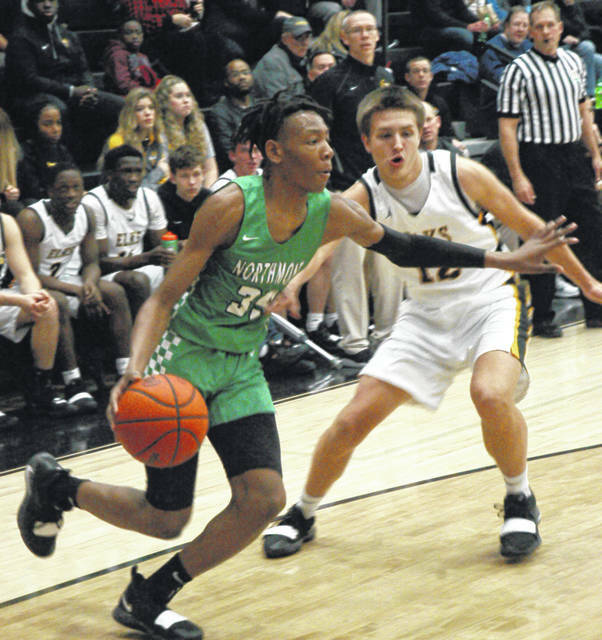 CENTERVILLE — Northmont’s game plan Friday night was to take the ball right at Centerville’s 6-foot-9 forward Mo Njie with the hope of drawing some fouls to get him on the bench and out of the way. That plan did not work. Njie blocked eight shots and scored four dunks to lead Centerville with 16 points during a 70-49 victory over the Thunderbolts. Njie committed only three fouls the entire game, one in each of the first three quarters, one of which was a player control foul. With Njie dominating the paint the Elks out-rebounded the Thunderbolts 42 to 25, including 12 offensive rebounds. Andrew White also blocked one Northmont shot inside to compound matters. The Elks jumped out to a 10-2 lead and led 16-8 at the end of the opening quarter. Northmont fought back to trail 19-14 with 5:22 remaining in the first half but the Elks took a 28-18 lead at the break. The Thunderbolts fought back hard in the third quarter. Despite Njie blocking two Northmont shots in one possession the Thunderbolts managed to go on a 10-0 run to tie the game on a 3-point field goal by Patrick Ivory with 3:16 remaining in the third quarter. The Elks outscored Northmont 8-2 in the final three minutes of the period to take a six point lead entering the final quarter. Prophet Johnson scored the opening bucket of the fourth quarter to cut the deficit to 38-34. 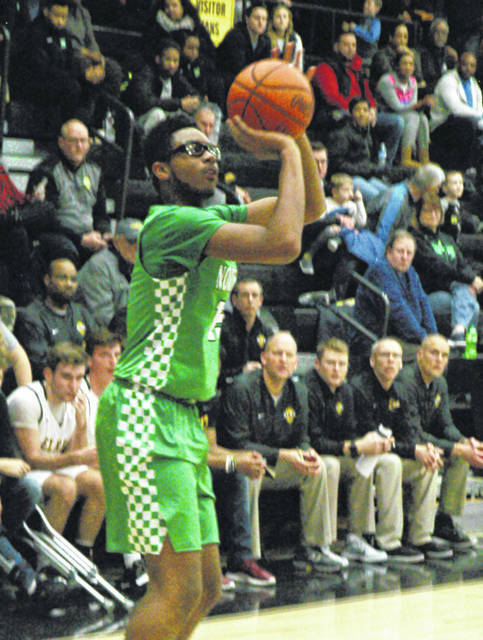 The Elks tossed in a pair of free throws and Di’talian Rayford buried a 3-pointer to pull Northmont within three, 40-37. Njie countered with a dunk for the Elks and Jordan Smith scored inside for the Thunderbolts to keep it a three point game. Leading by seven with 4:34 left the Elks went on a 7-0 run to take a 55-41 lead to effectively put the game out of reach. With 55 seconds left the Elks pulled all of their starters. Two Centerville players came off the bench, Corey Burnette and C. Smith, to bury 3-pointers to add insult to injury. 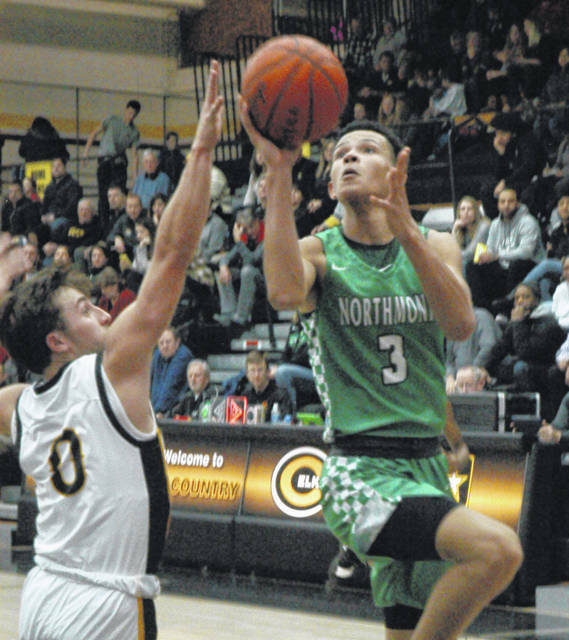 The Elks extended their winning streak to six games while Northmont suffered its eighth consecutive loss. 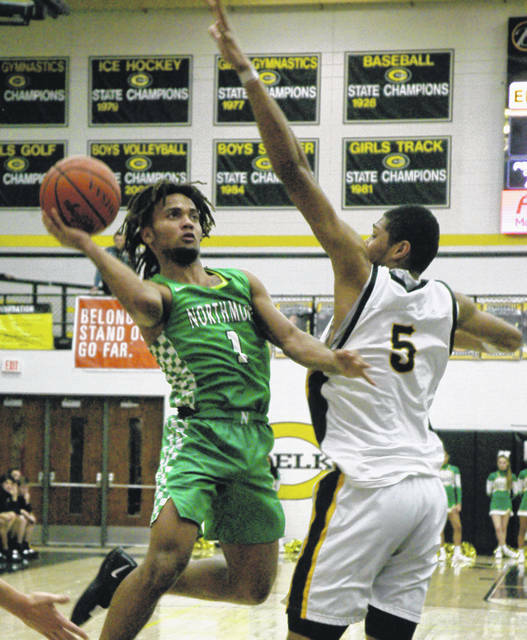 Northmont faces 11-2 Trotwood-Madison on Saturday (7:30 p.m.) and travels to Alter (8-8) on Tuesday at 7:30 p.m.
Northmont: Danny Lewis 4-6-14, Di’talian Rayford 1-0-3, Patrick Ivory 3-1-7, Isaiah Baldwin 1-0-2, Jordan Smith 4-4-12, Prophet Johnson 4-2-11. Totals: 17-12-49. Centerville: Ryan Marchal 3-2-9, Corey Burnette 1-0-3, Matt Pearce 5-0-11, Mo Njie 6-4-16, Kebba Archimalo 1-0-2, Ryan Ballard 4-0-9, Jason Sneed 3-7-13, Davis Mumaw 1-0-2, Zimmerman 1-0-2, C. Smith 1-0-3. Totals: 26-13-70. Three-point goals: Northmont 3 (Rayford, Ivory, P. Johnson); Centerville 5 (Marchal, Burnette, Pearce, Ballard, Smith). Records: Northmont 4-10 (1-7), Centerville 10-5 (6-2). JV score: Centerville 74 Northmont 30.